A big thanks to everyone who made it to our #noTTIP film night last night. There was a really great buzz and lots of energy for derailing this corporate power grab in its entirety. All of the films shown are available on YouTube, and we’re including the links below (they’re listed in the order they were shown). Feel free to take inspiration from our selection to put on your own film night in your area. Also, if you were there last night, let us know how it worked for you as a film night in the comments. Was the balance of the films right? Are there other TTIP films you’ve seen that could have been included? We’d love to know. Finally, make sure you’re on the 6 Billion Ways mailing list (sign up in the box on the right) to find out about our next film night in the new year. It will cost at least one million jobs. It will lock in fossil fuel dependency for the coming decades. It will irreversibly extend the privatisation of key public services such as the NHS. It will make it harder to regulate the banks. And it will give US corporations the power to sue the UK and other states for loss of profits when these governments introduce public policies designed to protect their citizens. It is the Transatlantic Trade and Investment Partnership (TTIP). If it goes through, it will be the greatest transfer of power to big business that we have seen for a generation. But now for the good news: there’s every chance we can stop it. 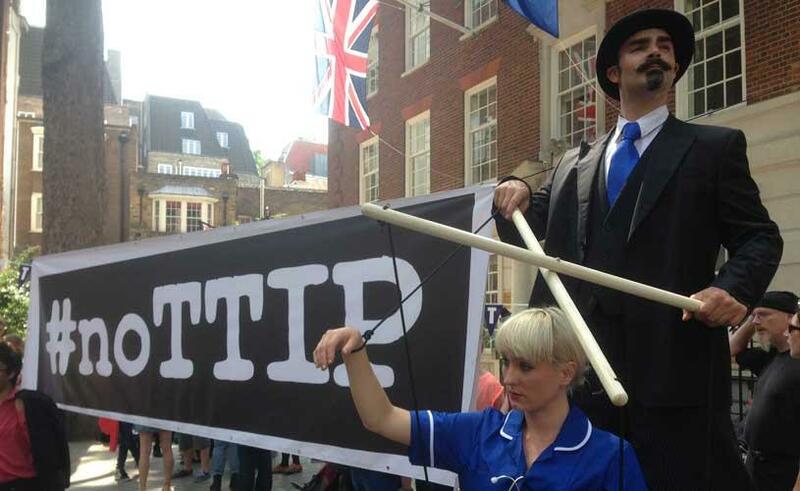 Join us for an evening of films and speakers on the growing fight back against TTIP. Find out how you can join the resistance, what local actions you can be involved in, and most importantly, discuss how we can win! Featuring films and speakers spanning over 30 years history of struggle by Britain’s black communities. 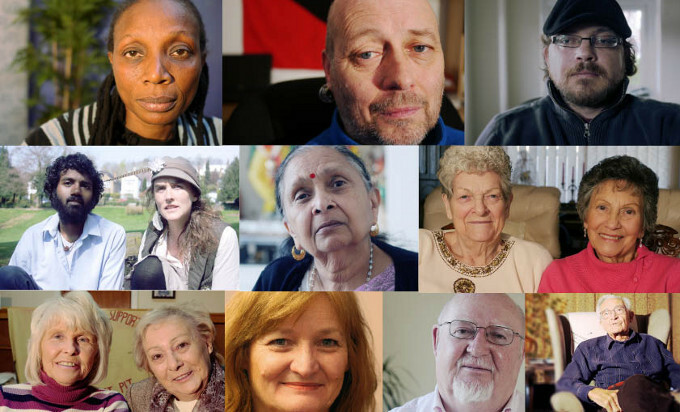 The stories of resistance and rebellion will cover the iconic self-defence campaigns of the Newham 7 in the 1980s, the Stephen Lawrence family campaign, the brutal deaths in custody, those criminalised and imprisoned in miscarriages of justice right through to those facing today’s war on terror. Learn about the victories achieved by militant community campaigns and the uprisings that rocked the country as the UK’s black communities fought to establish and strengthen their place within British society – in the face not only of individual prejudice but trenchant state racism, not least by institutions like the police and the courts. These ten moving and often funny short films document a proud 50 year history of campaigning, strikes, occupations, work ins and solidarity in the name of fair pay, decent jobs, and economic justice. The films are made up of interviews with key organisers, speaking about the tactics they used, what was successful, what wasn’t, and where they see the struggle for economic justice going today. The film night will also feature a discussion with the film maker, and organisers from key current economic justice movements in London for a chance to talk about how social justice activists today can learn from the lessons of other movements past and present. With speakers from the 3cosas campaign, student strike solidarity and South London Anti-Fascists. The films form part of the Economic Justice Project which aims to provide opportunities for people to learn about the basics of economics and the financial crisis, vital tools for social and economic justice activists. It also brings people together who have similar aims, but don’t usually work together. From global justice campaigners, to anti-cuts activists, there has never been a better time to recognise what we share and how we can strengthen each other’s work. Films produced by Jubilee Debt Campaign for the Economic Justice Project. 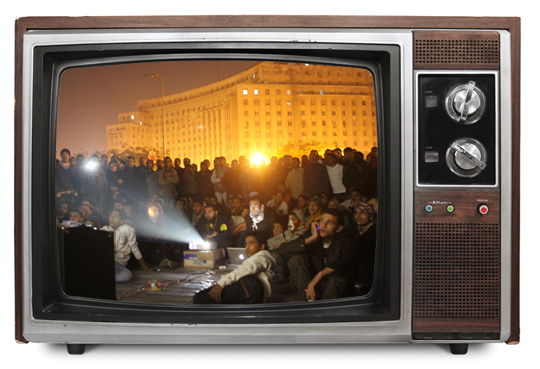 There was a full house at our Egypt film night on Wednesday, but if you missed it or wanted to see the films again, the main ones are online. We showed edited extracts of this 50 minute documentary at the film night, but it’s worth watching in full. This was our main feature, telling the story of the ousting of Mubarak and the progress of the revolution in 2011 through interviews with five of the people who tweeted the whole way through. It’s a fast-paced, gripping film, which is also 50 minutes long. Activist video collective Mosireen’s YouTube channel is still being updated with footage from the latest developments, though it’s only slightly older videos that have English subtitles yet. The Egyptian revolution was heralded by some as a social media-instigated uprising. Yet there was far more to the revolution than tweeting people onto the streets. As we reach the second anniversary of the overthrow of Mubarak, 6 Billion Ways will be looking at the revolt behind the headlines, including the strikes in factories like Mahallah which helped bring the regime to its knees. Every revolt uses the latest technology available to it. And while it was less lauded than Twitter, video collectives such as Mosireen and Kazeboon were able to make use of cheap video editing to show the reality of the regime’s violence to a wider audience. Kazeboon in particular actually organised screenings in communities around the country, bringing the revolution even to those unable to read. If the UK receiving a month’s rain in a day wasn’t enough – or the unbelievable speed the Arctic’s melting – a new report released this week shows that climate change is already here: it’s already costing the world $1.2 trillion a year (the combined GDP of Norway, Denmark and the United Arab Emirates), and is set to get far worse. 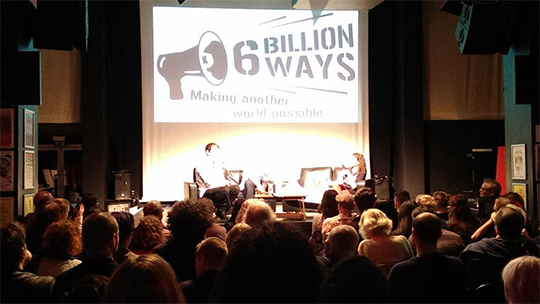 As the recent 6 Billion Ways film night showed, it’s because vested corporate interests are keeping us hooked on dirty fossil fuels while they rake in billions. The film night also showed how the very same energy system is failing billions across the world who continue to live in energy poverty. If we’re to fix our broken energy system, tackling climate change and energy poverty, then we need fair, ambitious action from world governments. But the last big chance we had – this summer’s UN Sustainable Development Conference, aka Rio+20, didn’t deliver. Friends of the Earth’s analysis shows how bad the deal was for people and the planet, and a follow-up blog from the World Coal Association (WCA) surprisingly agreed – or is that a sheepskin coat you’re wearing, Mr Wolf? My gut tells me anything the WCA sees as good must be bad, but reading the blog I found them calling for global action on energy poverty – echoing Friends of the Earth. Over a billion people are without access to electricity, with another billion unable to afford it or with no reliable connection. Almost 3 billion rely on polluting fuels like coal and wood for cooking and heating, with serious health impacts particularly among women and young children. So the WCA wants to tackle this? The devil is in the detail: what WCA means when it talks about energy access is ramping up coal-fired power stations. The name’s a bit of a give away. Its members include some of the biggest, most polluting fossil fuel companies in the world like Rio Tinto, Xstrata, BHP Billiton and Glencore. Coal is their bread and butter, and if energy access can justify building more coal plants, well then great. Except it doesn’t deliver energy access – quite the opposite – and we desperately need to stop burning fossil fuels if we’re going to prevent catastrophic climate change. Unlike Friends of the Earth, WCA’s Chief Executive, Milton Catelin (ex-climate change advisor to Tony Blair!) welcomes the Rio+20 Outcome for keeping fossil fuels on the table and its “recognition that renewable energy sources are not the only path to achieving global energy access objectives.” He also calls for UN Secretary General Ban Ki-moon’s flag ship initiative, Sustainable Energy for All (SE4All), to recognise the importance of coal in delivering access. But what exactly are those claims based on? It might sound logical that more power stations – coal or not – will lead to more people accessing electricity, but it doesn’t work like that in many countries in the global South. In India more than 400m people have no electricity access and the aggressive building of coal-fired power plants has not tackled this: the East of India, with the highest number of plants, also has the lowest levels of village electrification – the electricity is sent to the richer urban centres and heavy industry. And the myth that coal is cheap an abundant is now finally being allayed as volatile commodity prices show. Contrast that against the falling cost of renewables and the addiction to coal sounds criminal. Ironically, while energy access officially justified building a giant coal-fired power station in South Africa, the Medupi plant will actually reduce energy access as the loans to build it will be paid back through increases on already unaffordable electricity bills, leading to even more people being cut-off. The WCA represents a growing trend of the fossil fuel industry to paint itself as champions of sustainable development. Coal company Peabody Energy talks of ‘energy access for all with green coal’; the shale gas industry touts itself as the low carbon solution we’re waiting for, despite the International Energy Agency showing that exploiting it will cook the planet. The fossil fuel industry is tricking us with this language into accepting the same false solutions that got us into this mess in the first place. There’s a reason the world is facing multiple crises, and that’s because business as usual has been a disaster for this planet and the majority of people in it. We can’t let them do it again. We need new models that can deliver. For energy access, breaking from business as usual means moving away from traditional grids. While they’re important, they’ve failed to deliver for the world’s poor. We need to accept that of those without access to electricity in Sub Saharan Africa, 70% are off-grid in remote or rural areas. The grid will never reach, and renewable technologies like solar PV or micro-hydro are often the cheapest and most effective electricity sources. Local energy projects can create local employment and technical skills, while access to energy is itself a great catalyser for development, powering water pumps, small-scale irrigation or small businesses, as well as helping the realisation of basic rights like education and health care. Putting communities at the heart of clean energy access has been a great success in places like Brazil, Nepal or Indonesia. In Indonesia, Ashden Award winner IBEKA (who featured in our film night) is helping communities set up and run their own micro-hydro plants, transforming the lives of local residents. Renewable energy cooperatives can put people and the planet first. So I do agree with the WCA on one thing: we need global action on energy poverty. But we have to make sure we adopt the right models and right policies, guiding investment towards real, not false solutions. Renewables over coal, decentralised over centralised, communities over large corporations. Big corporate fossil fuel interests will keep talking the language of sustainability and it’s down to all of us to call them out, to call a pig in lipstick a pig, and to demand that our politicians stop listening to dirty industry and start putting us and the planet first. 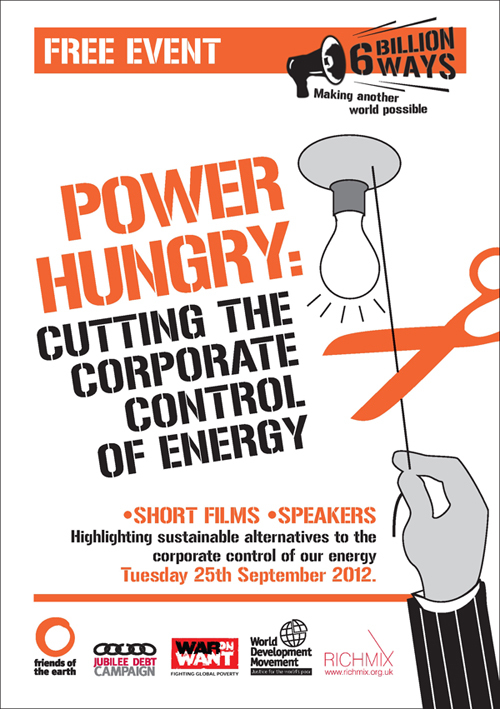 Thanks to everyone who made it down to Rich Mix for our latest film night, ‘Power Hungry: Cutting the corporate control of energy’. And a massive thank you to all of our speakers and everyone who gave a shout-out about their own energy campaigns. Tar Sands: To the Ends of the Earth – not out yet, sorry! Our current energy system is rapidly running out of steam. Corporate giants have spent decades destroying communities and ecosystems all over the world to extract fossil fuels but it is clear this has to stop. Our planet is burning, but powerful energy companies block any real attempts to stop climate change. Instead they promote false solutions like shale gas which are just as polluting and destructive. Fuel prices are soaring, leaving many in cold homes, while billions around the world have no access to electricity at all. We need a new system that provides clean, safe energy for everyone before it is too late. As promised, here are all the links to the films and clips we showed at our London Olympics film night on Tuesday 8 May. Now you can do your own local film showing! Contact the organisations listed for leaflets, materials and possible speakers. War on Want sweatshops film – not available yet – sorry! Benjamin Zephaniah – put the number in your phone! Monthly updates on events and activism.